Around this time of year, it's always hard to pick outfits because the weather changes so much. It might be freezing in the morning and warm and sunny by the afternoon, with some rain in between. I'm loving the bright color trends and colorblocking for Spring. 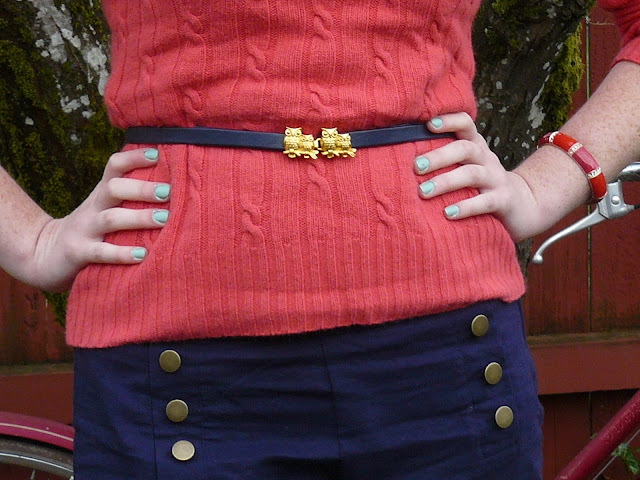 I found this coral sweater for $2.50 yesterday, along with this $4.99 owl belt. Gotta love the Goodwill! I found the pants at Forever 21 today for $6.99. You can't see them that well in the pictures, but I'm trying out matte top coat on my nails.